An organized and well-powered workspace is the foundation for productive work. For use with Humanscale M2, M8, M8 Dual, and M/Flex monitor arms, you can be sure your screens and devices get the volts they need with the Humanscale M/Connect Docking Station Retrofit Kit. Never go without power with this functional retrofit kit and docking station. Streamline your screens; the unit saves space and routes cords while giving users easy-to-access power ports at the rear of their workstations. A USB 3.0 port allows for lightning-fast data transferring, and features one-handed removal access for more stability for when you want to unplug than comparable stand-alone USB ports. The USB hub sits above your desk for ease of use, while the docking station sits below the desk, to hide cords and keep things looking clean. Life moves fast, and when you need a seamless workspace that can keep up, the Humanscale M/Connect Docking Station Retrofit Kit is your go-to tool to keep your workspace ergonomic, productive, and copacetic. 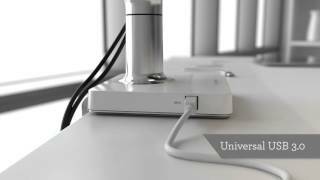 The Humanscale M Connect Docking Station Retrofit Kit is available in three models based on your current Humanscale monitor arm – the M2 arm, the M8 arm, or the M/Flex arm. All models feature a clamp mount that can be clamped to the edge of your desk or through a grommet hole. The Humanscale M Connect Docking Station Retrofit Kit is available in three color choices: a silver post with gray trim, a brushed aluminum post with white trim, or a black post with white trim. Choose the color that matches your current Humanscale monitor arm. $429.00 List Price: $568.00* The list price is the same as the MSRP (Manufacturer's Suggested Retail Price). It may not necessarily be the price at which the product is sold.